The war was fought over Korea. The Japanese imperial forces engaged the Beiyang army, as China did not have its own national army. The Japanese won virtually every engagement at land and sea. Source A: "Ostensibly the Sino-Japanese War was a conflict between Japan and China for dominance over China's tributary, Korea. In reality, it was a Japanese attempt to preempt Russian expansion down the Korean Peninsula to threaten Japan." 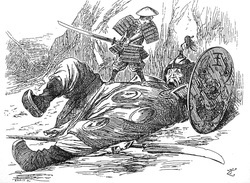 Source B: "According to E.H. Norman, a post-World War II scholar of modern Japan, this war and its results-the victory and humiliation under force-marked Japan's turning point toward imperialism." 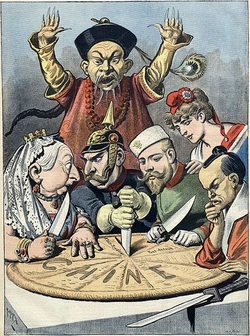 "In 1894, one of the great international conflict lines of modern times opened up between China and Japan. ‘999 out of every 1000 Chinese are sure big China can thrash little Japan,’ wrote Robert Hart. On paper, China had just over a million men at arms to throw into the war - 325,000 of them Banner troops, about the same number of ‘Green Standard’ Han soldiers, plus 400,000 other men said to have undergone training. The real numbers fell some way below these totals, however, and some elite Manchu forces still prided themselves in their expertise with bows and arrows rather than guns. Japan’s 270,000 troops were well trained and had modern arms. Tokyo had also broken China’s military cable codes. Qing armies were split between regional and princely chiefs; Japan’s were unified. On the other hand, Japanese commanders were given clear objectives and left to get on with the job in pincer attacks which flummoxed the Chinese. The focus now switched to the sea, providing the first test for the navy of thirty warships which Li had built up with purchases from Europe, despite the depredations of members of his family, who had pocketed the money allocated for explosives and packed shell casings with sand. Two days after the Japanese took Pyongyang, they won a six-hour naval battle at the mouth of the Yalu river on the Korean border. China lost four ships." Failure in the war leads to the 100 Days Reforms. Task: Analyse this source, how the Sino-Japanese war changed international perspectives of both a) China b) Japan?